.NET runtime traditionally has strict rules against running managed code from a network. In Visual Studio 2008 (CLR v2) to run Tabs Studio from a network share you had to add special “Code Access Security Policy”. 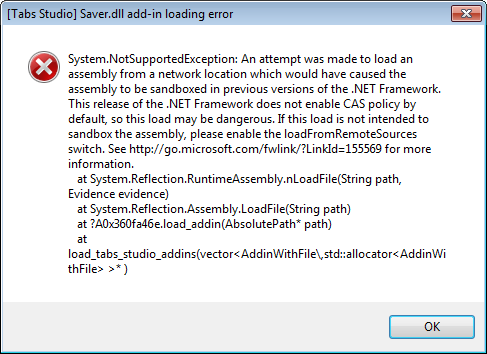 Plus you have to upgrade to Tabs Studio v2.0.6 that workarounds Assembly.Location throws ArgumentException. 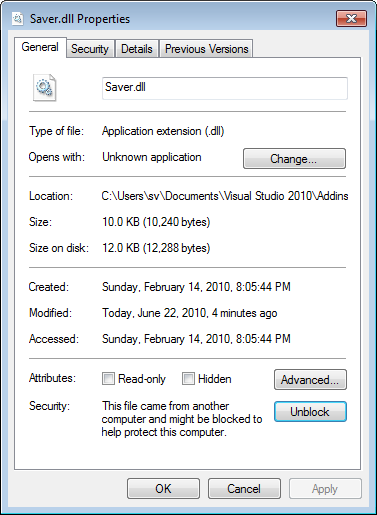 To solve this problem you can either unblock Saver.dll in Windows Explorer or enable the loadFromRemoteSources switch in devenv.exe.config the same way as for running Tabs Studio from a network share. Thanks, this really helped. I have My Documents redirected to a network location which means that my Visual Studio\Addins folder is also on the network path. After adding this entry, this, and another addin that was not working, loaded successfully. Thanks again. Under Vista or Windows7 take care of thefile system Virtualization. leaving the original file untouched. This depends on your user settings. tag, save the file and close. This will edit the original file, not the virtualized copy. Thank you for the tip. I’ve added a note to run an editor with admin rights. 1. Run notepad as administrator. 3. Add the line just under the tag in the file. 5. Restart Visual Studio, go to Tools/Add-in manager and make sure “Tabs Studio” is loaded.